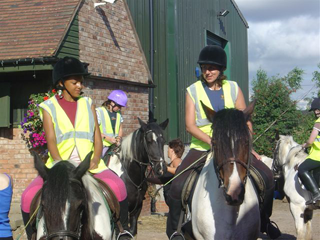 Horse Riding holidays at Dunton Stables are for horse lovers of all abilities. Adults and children (from 8 years) are involved in a wide range of riding activities as well as being closely involved in caring and stable management tasks. Our 2 day horse riding weekend breaks are all about being as hands on as you want to be and are a fantastic learning opportunity for both new and experienced riders. Whether you want to learn to ride or enhance your skills, our horse riding holidays are tailored to your requirements. Breakfast and lunch are included in the price and an evening meal of your choice is available to you at one of the many local eating places. So whether you're looking for a horse riding weekend, holiday or break, you can be safe in the knowledge that all of your needs are taken care off. Dunton Stables is an established horse and pony trekking centre and riding school situated in the Heart of England with excellent transport links, by road and rail, to the rest of the country. We are an ABRS approved establishment and that means that we are regularly inspected and meet high standards of care, welfare and riding instruction. Dunton Stables have been providing horse riding holidays & breaks for many years and we hope you will come and make long lasting memories with us. The managers live on site and with the support of their committed staff team and volunteers, provide a warm and friendly environment for all visitors and clients. We have a very flexible and innovative approach and are able to customise our riding breaks to best suit the desires and needs of our clients. Our riding holiday horses and ponies are well schooled and forward going. The coloured cobs that we favour are steady and reliable, each with a unique character. They work well in lessons and love the fun of cantering or trotting out on treks. Some are more suitable for experienced and confident riders whilst others are ideal for novice riders wanting to learn the very basics of riding and horse re. They range in height from our Shetland ponies to our heavier cobs and our handsome Henry who stands at 17.3hh. All are well loved and cared for and are good to work with on the ground as well as from the saddle. Trekking, either in walk, trot or canter, forms part of any riding break. For new riders, we start with a Mini-Trek that is taken in walk with experienced leaders on foot. 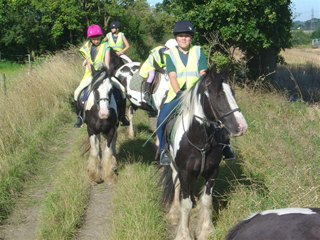 This is a relaxing and enjoyable way to ride through the countryside and to become accustomed to the horse or pony. For riders who can ride in rising trot, a 2 hour trek to and around Kingsbury Water Park, with its 620 acres of lakes and woodland, is a fantastic experience and great fun for the horses who enjoy a drink at the lakeside edge. A trek to the local canal side pub for lunch is a must for novice and experienced riders. All riding break clients will enjoy and benefit from riding instruction provided by competent and qualified instructors who really listen to what you want to achieve. Their aim is to encourage and support you and to agree some realistic goals with you that will be challenging yet achievable during your stay. Riding lessons are fun and informative with lots of useful feedback and the opportunity to ride a range of horses and ponies as well as try some new riding techniques. Our instructors are great confidence givers who get pleasure from helping you to succeed. A really good way to build a rapport with your horse is to be involved with looking after him/her on the ground. We encourage each client to be as hands-on as he or she wants to be in grooming, bathing, tacking up and general horse presentation. Supervision is always available and your health and safety is very important to us. We are happy to provide experienced and competent staff to work with you and for you to learn as much as possible during your stay. Our aim is to provide all of our guests with a unique horse riding break that is varied, fun and good value for money. Whatever your ability, we can tailor make a break to suit your needs. Our riding breaks run all year around. The UK riding holidays that we provide are suitable for novice and experienced riders and are ideal for a family or a small group of friends. We accommodate no more than 4 riders at a time and offer an extensive and varied activity package that ensures you get the most out of your pony trekking break with us. Breakfast, lunch and dinner are included in the price as well as any morning and afternoon snacks. Our horse riding holiday itinerary details what is on offer. Our riding holiday horses and ponies are well schooled and forward going and are suitable for novice and experienced riders. The coloured cobs that we favour for trekking are reliable and steady yet enjoy the fun of cantering across the fields and heath land and trotting through the wooded glades and around the pools and lakes. The route for our horse riding holidays follows the bridleway from our stable yard leads to Kingsbury Water Park and its 620 acres of parkland and landscaped lakes, well known to our horses who look forward to a drink at the edge of the lakes on their route around the park. Whilst breakfast is served in your accommodation, all other meals are taken at outside venues. These include the local canal side pub and other local hotels and hostelries well known for the standard of their food and service. Our aim is to provide all of our guests with a unique horse riding break that is varied, fun, relaxing and value for money. Whatever your ability, whether you are a regular rider or someone who rides occasionally, we can meet your needs. Our trekking and riding breaks run all year around. Please contact us to discuss your requirements and suitable dates.